We love exploring animal tracks. We investigate the tracks left by local animals. Frequent visitors to our yard, and local parks, are birds, squirrels, dogs, cats, and deer. This is especially when snow blankets the yard. Bubbles are great for outdoor play in the winter. The bubbles last longer and are slightly harder to pop, which thrills my boys. 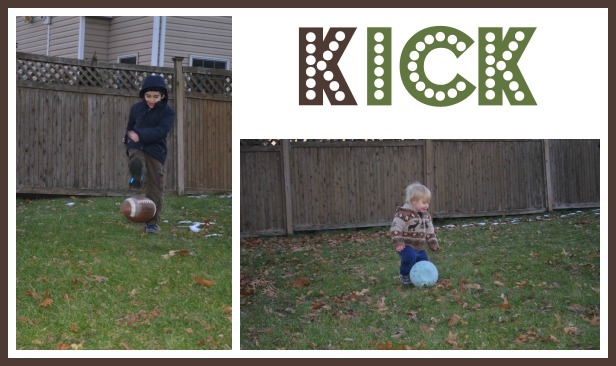 Chasing bubbles never fails to get the kids moving – and keep them warm! Add some color to the snow. Use spray bottles filled with water and food coloring. Or crush up sidewalk chalk and mix it with water. Freeze ice cubes with colored water, and hide them in the snow. Or let them melt and watch the colors blend together. Pick up branches, drag them along behind you, knock snow off of trees. 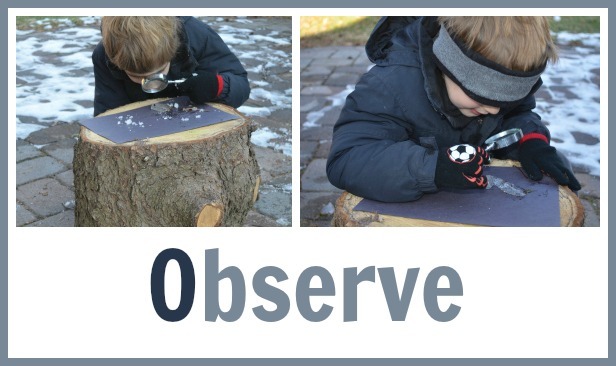 Use branches or your (gloved) hands or feet to draw pictures, letters, shapes, make trails. 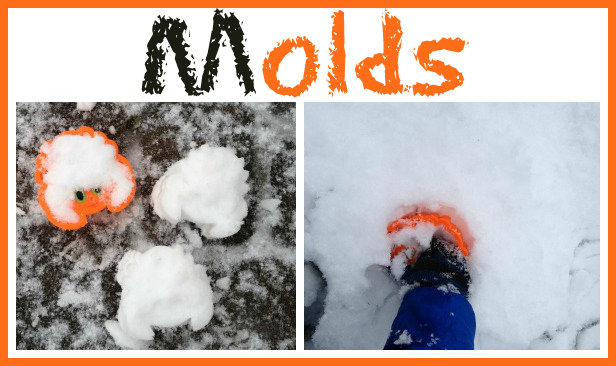 Try some experiments outside to illustrate physical differences dependent on temperature. 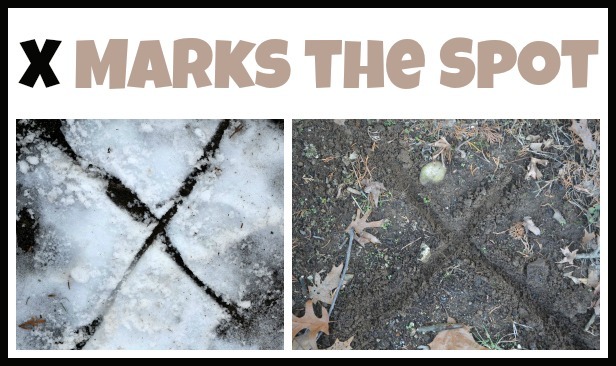 Ice experiments: Try to see how you can get ice to break (we like to drop it on our patio, or stomp on it). See if salt stops water from freezing. Get 2 similar containers. Put plain water in one, dissolve salt in water in the other, and see which freezes. You can also observe the time it takes for the water to freeze. Snow experiments: Bring snow inside. Leave some on the counter, put some in the refrigerator, some in the freezer. Compare the rate at which they melt. Measure the snowfall. Building snowmen together is a classic for a reason! It’s a must-do if you’re in an area with snow. We also made a “snowman bag,” which contains odds and ends that we will use to decorate a snowman. It hasn’t snowed since we put the bag together, but when it does I will add a picture! Winter is full of greys and browns. We look for the trees that are still green, compare them to trees that have lost their leaves. 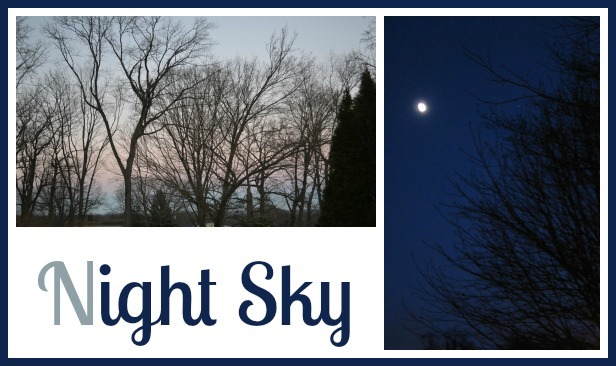 My preschooler also loves to look for other signs of winter, and differences in the seasons. He notes things like fewer animals because of hibernation or migration, no bugs, thicker coats on the animals that we see. Kids love searching games. I’ve made up hunts for different colors, scavenger hunts, treasure hunts, and searched for different sounds. We’ve hunted for letters, numbers, and shapes. We’ve tried to find different animals, or looked for their tracks. On days I bundle them in the stroller, we play jogging stroller bingo. We jump on shallow frozen puddles to break the ice, slide on ice, and watch icicles. And, of course, there’s always ice skating at local ponds and outdoor ice rinks. I have the most success playing with my kids outside in the cold when we are all moving. Jumping games are a great place to start. I put a jumprope on the ground to hop over, wiggling it for my older son. We play hopscotch (traditional, or using the alphabet or colors or shapes). We jump from hula hoop to hula hoop, or over logs. Grab some balls and get kicking! We also practice kicking our legs up, or kicking a leg over a tree stump. 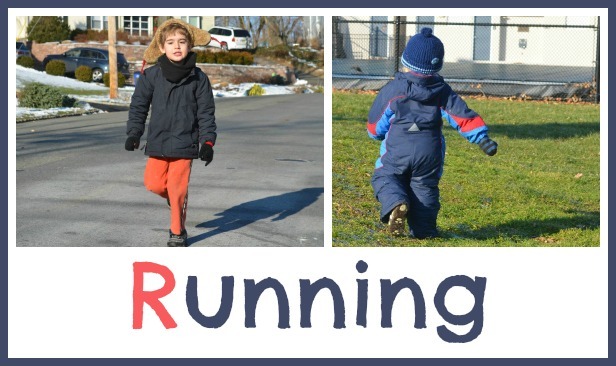 All of these gross motor activities get you moving, and keep you outside and warm for longer! We got out glow sticks, and played with them in the snow. The glow sticks produced a fun contrast against the snow. Flashlights are also fun. 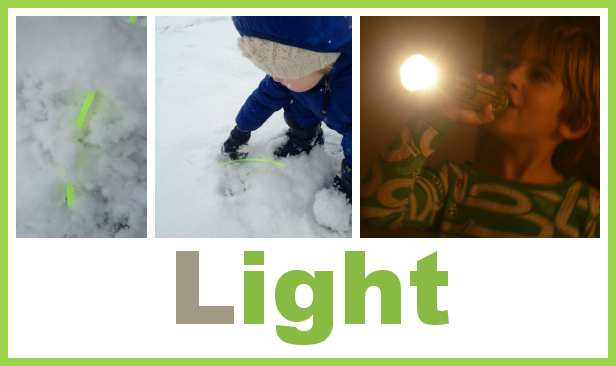 Especially on overcast days, we get out our flashlights, and go on quests around the yard, looking for chipmunk holes or pinecones or bird nests, shining the light on the object we find. Dirt cake? Snow cookie? An outdoor play bakery can serve it all! We bring cookie cutters and sand toys out to play in the cold, and make castles and food and designs from the various molds. Grab a magnifying glass and go outside. We look at snowflakes up close (particularly on a piece of black construction paper). We also look at dried leaves, grass, acorns, and gumballs. We look for signs of spring, and keep a “nature diary” in which note the changes in seasons we’ve observed. 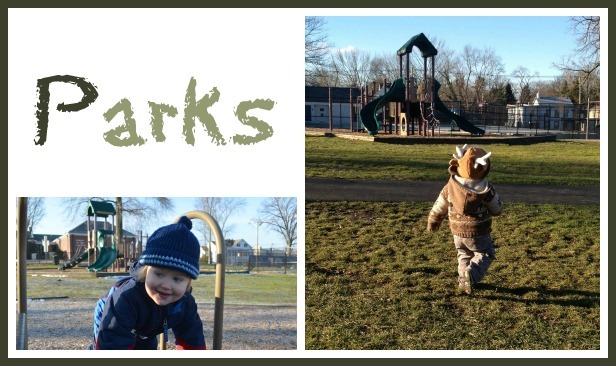 Parks and playgrounds are basically deserted have them to yourself. As long they are bundled up, we have a great time running around the equipment. I only let my kids walk up the slide if no one else is there, so this is the perfect time! Sometime we take a break from all the running and shouting, and are very quiet. We listen to the sound of the birds, to the faint ring of children yelling at a local playground, to the wind in the branches. 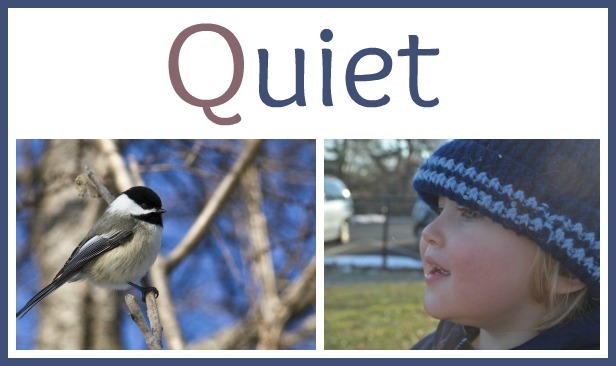 My toddler was recently thrilled when he stayed quiet listening to birds, and then several birds landed on the grass nearby. We love running games: tag, relay races, obstacle courses, three-legged races, fox and goose, are just a few that come immediately to mind. Dig, dig, dig! I recently entertained a gorup of 4 preschoolers for an hour just by letting them dig in my backyard. (Of course, this requires a high tolerance for having your backyard dug up). 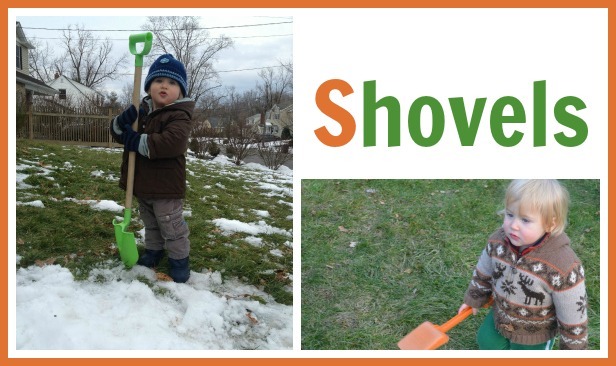 Other options are woodchips, sand (we use our sandbox as long as it’s not piled with snow! ), and, of course, snow. Trucks, construction vehicles, cars: bring out your whole motorcade! 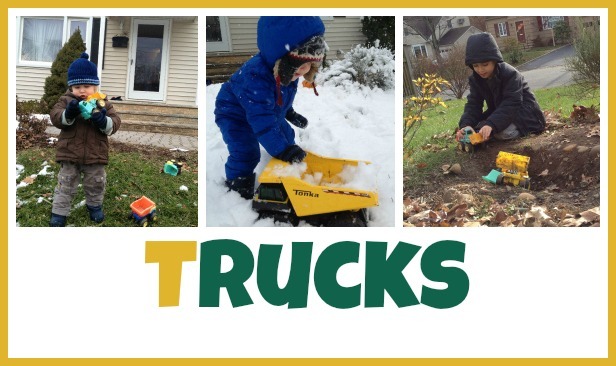 Kids love transporting pinecones, racing through dirt courses, dumping out rocks. When we get a thick snowfall, it obscures the familiar backyard objects. We guess what’s under the white bumps in the yard. It becomes a treasure hunt in our own yard! 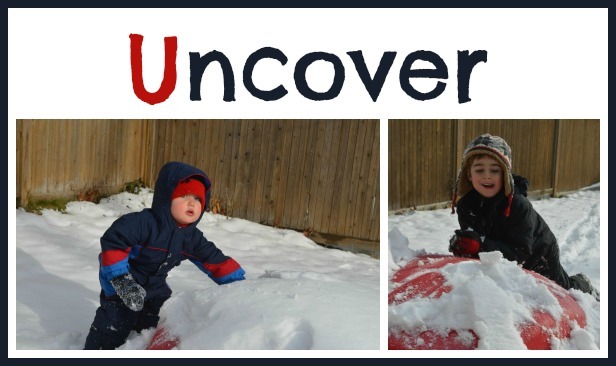 Ok, I know that’s a stretch for V. But I’m at the end of the alphabet and I realized that I hadn’t shared one of our favorite winter activities! 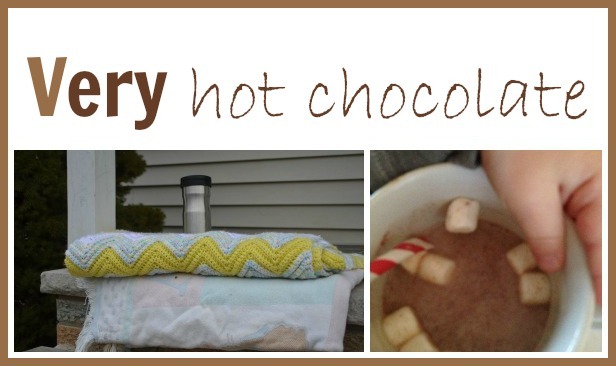 I bring a thermos of hot chocolate with us to the park for short winter picnics, and an easy way to warm up a bit. We also bundle under blankets on our front step, with a mug or thermos of hot chocolate, reading or just enjoying some time outside. 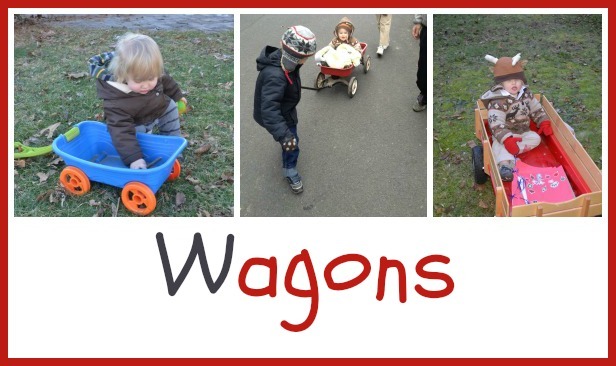 Grab some blankets and get your kids into the wagon for a ride around the neighborhood! Or let them pull the wagon themselves. My preschooler pulls his little brother around in the big wagon. And we have a small wagon that the boys pull, collecting treasures as the go. X marks the spot! We have played treasure hunts, and pirates. Pretend play ideas engage the kids. They love pretending to be superheroes or knights, princesses, or dancers. We set up backyard rescue missions and dance competitions, pretend cooking exhibitions. For my boys, yelling and moving around seem to go hand in hand. The louder we are, the more we’re moving around. 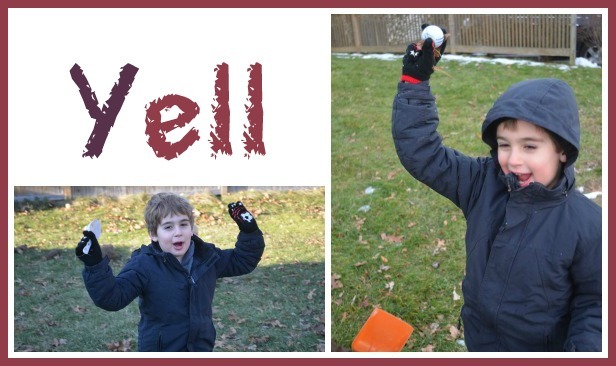 One of our favorite games is ball-less baseball, where we pretend to be batting and fielding baseballs, while yelling out the plays. Water freezes at 0 degrees Celcius. We have an outdoor thermometer (measuring both Fahrenheit and Celcius), so we point to the numbers, and discuss how cold it is when it’s 0 degrees Celcius (and 32 degrees Fahrenheit). 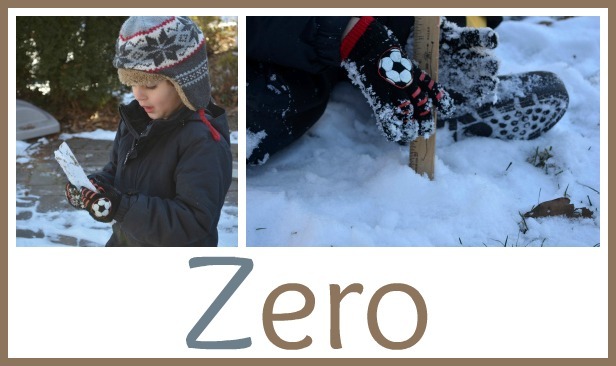 We also use other number measurements: snowfall with a ruler, collect rain in a jar to measure. Or we gather pinecones or acorns for some counting games.